Today was a pleasant day at Turkey Creek Sanctuary. The winter and year-long residents seem to be settling into their routines. The overall bird density was still low, but the number of species was greater than any point since the summer. 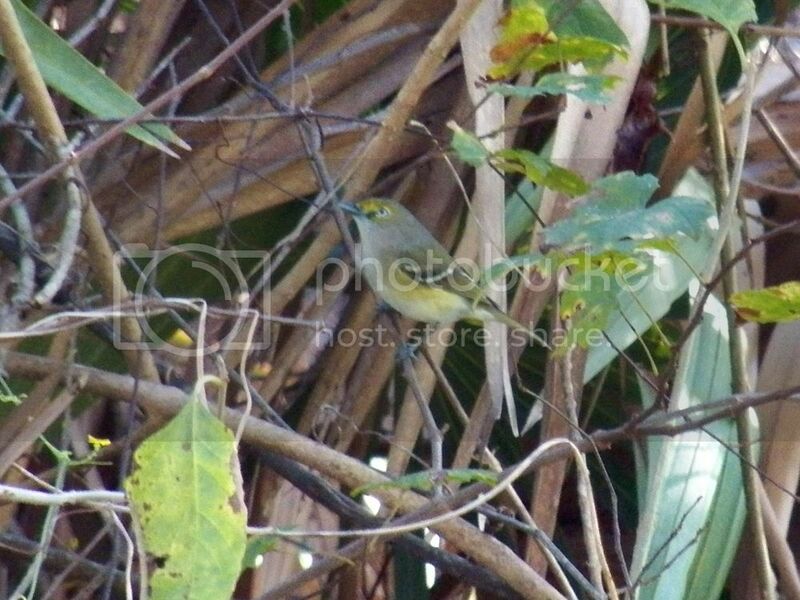 Most importantly, after almost an entire year, I finally managed to get that elusive White-eyed Vireo photograph! I almost missed it and I had time to fire off one shot in the shadows of the underbrush before it dashed off. But my quest is at an end! A photograph 11 months in the making! Speaking of vireos, I had a somewhat mysterious encounter with one near the start of my walk. I managed to observe the bird for a good while (sorry no pics – too busy birdwatching 😉 ), and my visual assessment doesn’t quite match with anything in my Peterson guide. 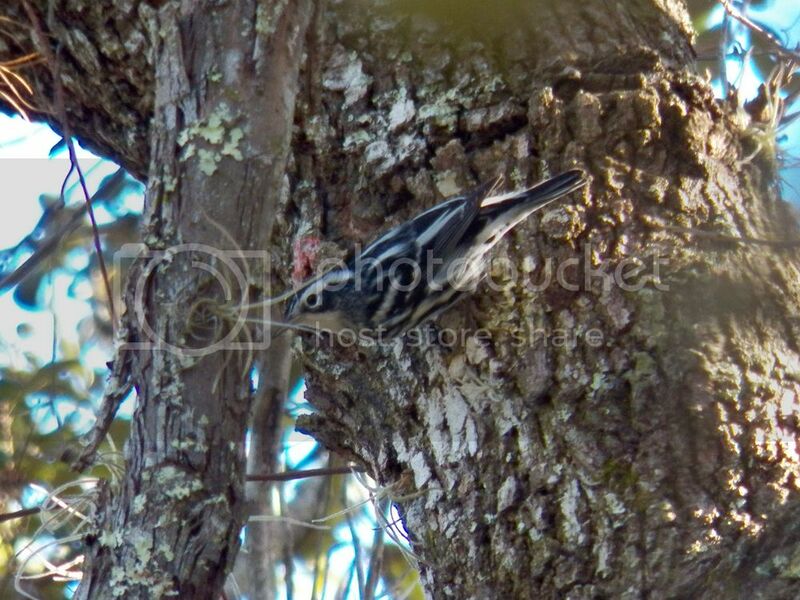 The bird was clearly a vireo by shape and size. It was an almost uniform gray with white wing-bars and white spectacles. The best fit is a Blue-headed Vireo; however, both my Peterson field guide and my Sibley guide indicate there should be some sense of yellow and/or greenish cast on the flanks and back. Here, some further explanation is needed. During the late 1990s, the Solitary Vireo was “officially” split into 3 separate but closely related species, the Plumbeous Vireo of the intermountain west, Cassin’s Vireo of the Pacific coast and northwest, and the Blue-headed Vireo of eastern North America. Generally the three species form what Sibley refers to as a “cline” from east to west of decreasing contrast and color. An illustration by Keith Hansen showing the plumage variation among “Solitary” Vireos. I mention all this because as I was making careful observations of “my” vireo, I had the distinct impression that it was almost completely devoid of color and of fairly low contrast. Upon further review, it most closely resembles the plumage of a Plumbeous Vireo. I will note though, that Sibley says there is hybridization and overlap in all plumages and even voice. Where that leaves me with proper identification, I am unsure as this species has not been reliably recorded this far east. As has been the case for most of the autumn, the most numerous and active birds in the Sanctuary are the Blue-gray Gnatcatchers. If you haven’t had a chance to observe these birds, let me just say that they are the tiniest balls of energy you’ll see in a bird, surpassed only by some hummingbirds. Despite their often being within only feet of me, it’s nearly impossible to get a decent photograph. My attempts today did yeild a fairly unique image. It’s a bit blurry, but I find it fascinating. 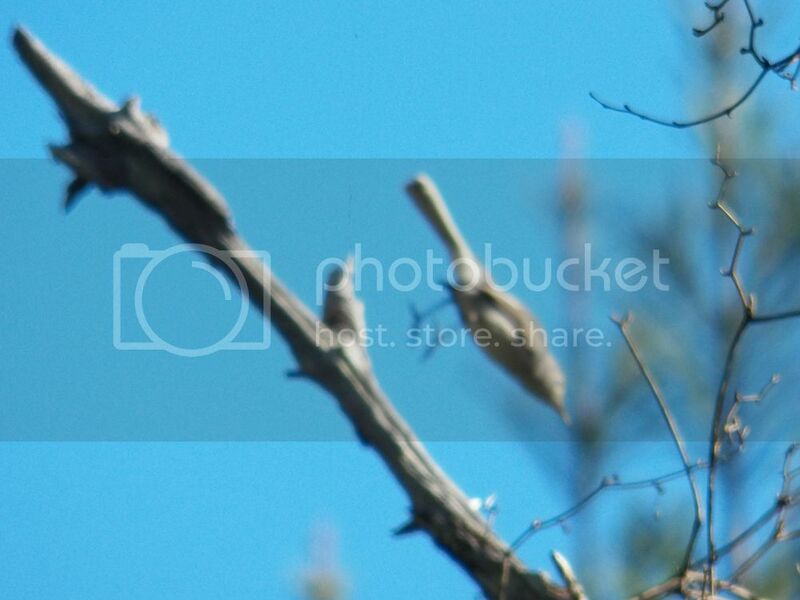 This was taken in the split second it takes one of these tiny birds to hop from one branch to another. Some other species that I observed today include the Black-and-white Warbler, Northern Cardinal, Gray Catbird, Ruby-crowned Kinglet, Red-bellied Woodpecker, Turkey Vulture, Palm Warbler, Tri-colored Heron, American Coot, Cattle Egret, and American Kestrel (the last four by the weir at the Melbourne-Tillman Canal). 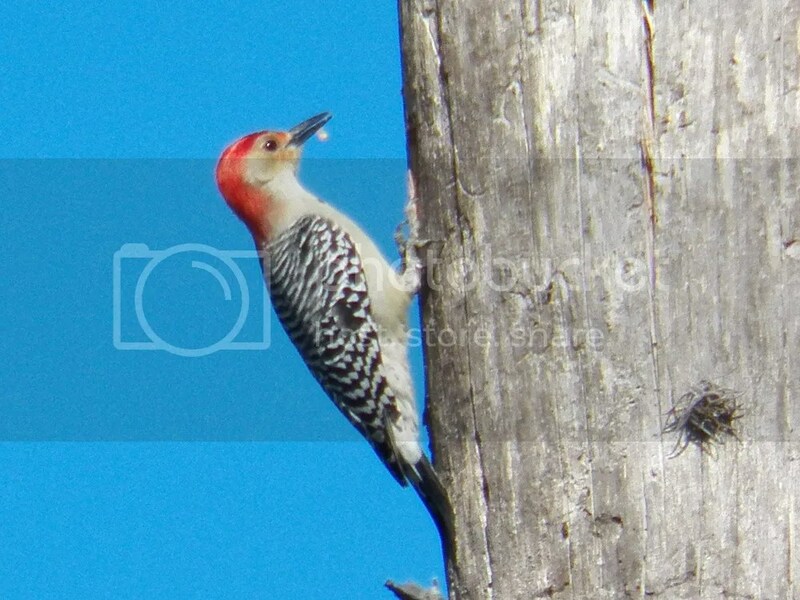 Red-bellied Woodpecker enjoying a little breakfast. 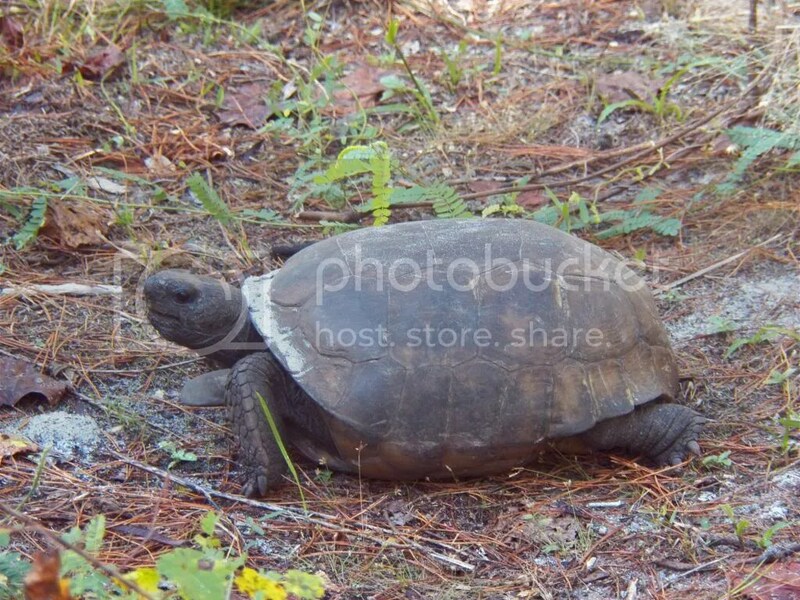 Today was extra active for the Gopher Tortoises that live in the Sanctuary. Here are a couple of examples of coloration difference within the species. 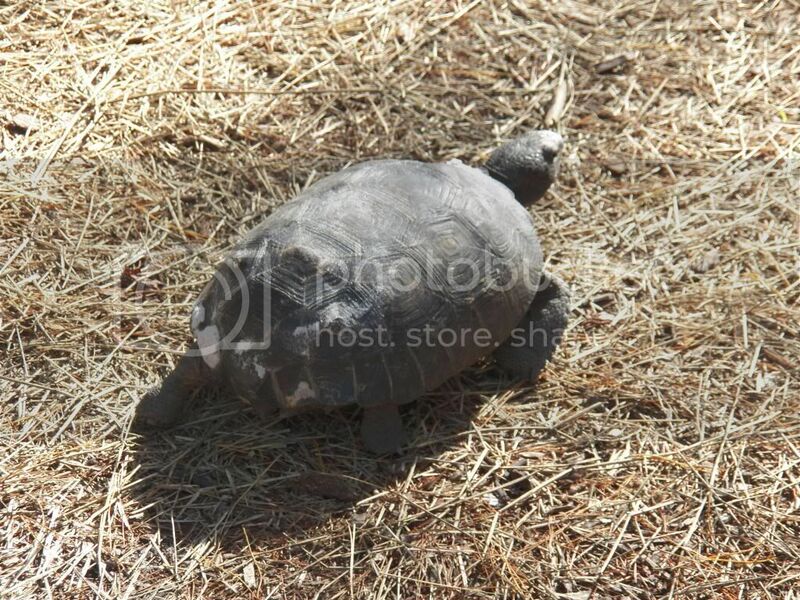 This dark green tortoise had a shell about 12” from front to back. This larger tortoise’s shell was about 18” long. Notice the reddish coloration. One very noticeable absence from the time I was at the Sanctuary was a total lack of squirrels. The last several trips there the squirrels were everywhere. Dozens and dozens. Today, I heard one scolding call deep in the underbrush, and that was it. I suppose all the frenzy of activity before could have been the squirrels fattening up for the “winter” here, and now they’re just lazing about, waiting for spring. But it was darn strange from my perspective! Posted on 2013 December 9 by Lonely BirderPosted in BirdingTagged American Coot, American Kestrel, Black-and-white Warbler, Blue-gray Gnatcatcher, Cattle Egret, Gopher Tortoise, Gray Catbird, Northern Cardinal, Palm Warbler, Red-bellied Woodpecker, Ruby-crowned Kinglet, Solitary Vireo, Tri-colored Heron, Turkey Vulture, White-eyed Vireo.